Five books of story, law, and poetry divided into 54 weekly portions. What Is the Torah Portion? The Torah, Prophets (Nevi’im) and the Writings (Ketuvim) collectively make up The Hebrew Bible (what Christians refer to as the Old Testament). The Bible is often referred to by the Hebrew acronym TaNaKh (usually spelled Tanakh, or Tanach). Numerous editions and translations of the Bible and the Chumash (the text of the Torah) can be purchased online. However, you can also read (and search) the entire Bible (along with many other major Jewish texts) in Hebrew and English translation free of charge on Sefaria. Readings from the Torah, which are divided into 54 weekly Torah portions (each one is called a parasha, or parsha), are the centerpiece of the Sabbath morning service. My Jewish Learning offers a summary, featured commentary and more than 10 additional commentaries for each Torah portion. Find more weekly Torah commentaries here. During the Torah service, the Torah scroll is taken out and the weekly portion chanted or read aloud. The Torah scroll, also known as a sefer Torah, is hand-written on parchment according to numerous specifications by a sofer (scribe), a specially trained individual. The Torah’s stories, laws and poetry stand at the center of Jewish culture. They chronicle God’s creation of the world, the selection and growth of the family of Abraham and Sarah in relationship to God in the land of Canaan, the exile and redemption from Egypt of that “family-become-nation” known as Israel, and their travels through the desert until they return to the land of Canaan. Along the way, Israel enters into a covenanted relationship with God, and God reveals many of the rules for governing a just society and for establishing appropriate worship. Genesis tells the story of creation, Noah and the flood, and the selection of Abraham and Sarah and their family as the bearers of God’s covenant. Stories of sibling conflict and the long narratives of Jacob and his favorite son Joseph conclude with the family dwelling in Egypt. Exodus tells of how the family of Jacob grew and then was enslaved in Egypt. The baby Moses, born of Israelites but adopted by Pharaoh, becomes God’s prophet who, after bringing 10 plagues down upon Egypt, leads the Israelites through the Red Sea to freedom and to the revelation at Mount Sinai. The story of the Israelites worshipping the golden calf, which follows soon after the revelation at Mount Sinai, is almost obscured by lengthy materials on the building of a sanctuary (tabernacle) in the wilderness. Leviticus deals mostly with laws of Israelite sacrificial worship. Related rules include the basis for Jewish dietary laws (kashrut) and issues of purity and impurity. The holiness code, which describes a sanctified communal life, is a highlight of the book. Numbers begins with a census of the Israelites and the tribe of Levi. A group of Israelites spy out the land of Canaan; their discouraging report sends them back into the desert for an additional 38 years, during which the Israelites continue to behave badly, rebelling against the authority of Moses and his brother Aaron, and having illicit relations with Moabite women. Deuteronomy is Moses’ final message to the people of Israel before they cross over the Jordan River into Israel. Moses reminds the people of how God has redeemed the people from Egypt and of the details of the covenant between Israel and God. In stark language, Moses describes the rewards for observance of the laws of the covenant and the punishment for disobedience. Finally, Moses passes along his authority to Joshua who will lead the people into the land. Traditionally, the Torah has been seen either as a document that was entirely revealed to Moses by God on Mount Sinai (along with the whole of the Oral Torah, i.e. 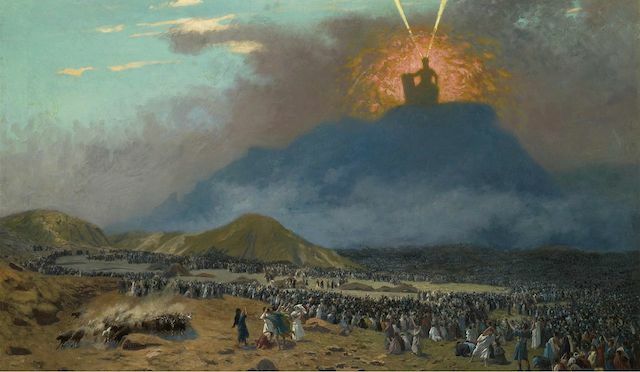 the Mishnah and other works of Rabbinic literature which build upon the written Torah) or that Moses completed the Torah during the trek through the wilderness (including what was revealed on Mount Sinai). Historians and literary critics, noting historical inaccuracies and duplications that indicate a composite text have suggested that the Torah includes sources from the period of King David and King Solomon (around 1000 BCE), from the seventh century BCE during the reign of King Josiah, and from the sixth century BCE during the Babylonian exile. In the works of the prophets, and in many of the writings, narrative elements from the Torah like the exodus from Egypt are re-used to make new points. Laws from the Torah like the specifics of Sabbath law prohibitions are also commented upon and expand their scope in later works. Another set of connections between the Torah and the Prophets is indicated by the weekly Prophetic portions (Haftarahs), which are paired with each of the 54 weekly Torah portions. Pronounced: PAR-sha or par-SHAH, Origin: Hebrew, portion, usually referring to the weekly Torah portion. Pronounced: SEH-fer TORE-uh, or SAY-fer TORE-uh, Origin: Hebrew, Torah scroll. Pronounced: KHUM-ush or khoo-MAHSH, Origin: Hebrew, the Five Books of Moses, or Torah, but published in book form, often with commentary. Pronounced: tah-NAKH, Origin: Hebrew, Hebrew Bible (an acronym for Torah, Nevi’im and Ketuvim, or the Torah, Prophets and Writings). Written by hand, a sefer Torah is produced according to strict specifications. The Hebrew Bible, or Tanach, is divided into three sections: Torah, Prophets and Writings. A guide for bar/bat mitzvah guests and other newcomers to Sabbath worship.